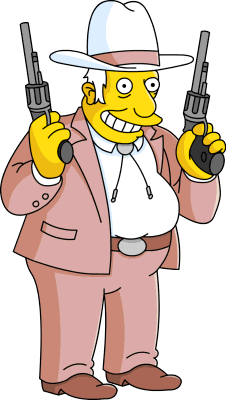 The Rich Texan is a rich, selfish, callous, but gregarious, business owner from Springfield. He wears a tan suit with a bolo tie and a white cowboy hat (which he wore on the day Kennedy was shot), and is in his 70s. Although he speaks and acts like a Texan, the "Rich Texan" is actually from Connecticut. Mr. Burns once called him "Shady Bird Johnson". He is an active member of the Springfield Republican Party and speaks with a heavy Texas drawl. Homer once addressed the Rich Texan as "Senator", although this was never mentioned again. He once owned a logging company and once attempted to cut down Springfield's tallest Redwood tree, until his company was destroyed by the gigantic tree after it slid down a hill. One of his fondest dreams is to build the world's first drive-through humidor. The Rich Texan always carried two revolvers, and he had a common habit of pulling them out and firing them into the air while yelling, "Yee-haw!" whenever he is happy or excited. Shooting on the "Yee", not the "haw", he explained once. He has been to jail at least once when one of his stray bullets hit a Texas Ranger and the police made him switch to blanks, but he noted that "They just don't feel the same". He once held Homer and Moe at gunpoint, while forcing them to walk along with him after being tricked by the two. He once went over the top and lost his mind after doing something generous for Ned. He revealed that he suffers from pogonophobia (the fear of beards and mustaches), the excuse he gives Homer for parking in a handicap spot; he then promptly shoots at least one man dressed as Santa Claus. He is also obsessive-compulsive and counts 1-2-3-4 before firing his pistols. The Rich Texan once stated that he enjoys moonlight walks on the beach. His license plate reads "NO SHAME". His grandfather fought in the Confederate States military. The Rich Texan has a gay grandson  and a daughter named Paris Texan (who looks and acts like Paris Hilton, and whose name is a play on Paris, Texas). 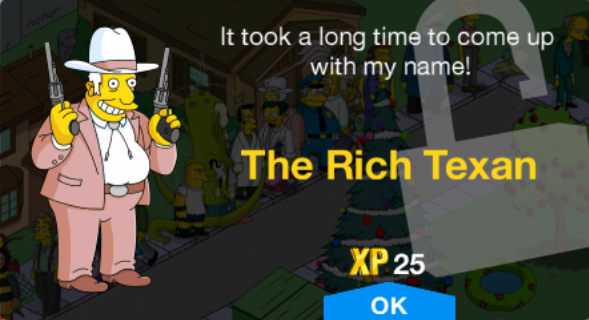 Wikisimpsons has a collection of images related to The Rich Texan. ↑ "Revenge Is a Dish Best Served Three Times"
↑ "The Seemingly Never-Ending Story"
↑ "$pringfield (Or, How I Learned to Stop Worrying and Love Legalized Gambling)"
↑ "Lisa the Tree Hugger"
↑ "The Simpsons Beyond Forever"
Modified on May 15, 2018, at 17:04.